I remember Chicken Cordon Bleu from my childhood…but have seen it in a restaurant in the last 15 years? I don’t think I’ve seen it (outside of my kitchen) for at least decade...probably longer. Which is a bit of a shame. Yeah, chicken cordon bleu is old fashioned. And yeah, there are a lot of great, “modern” chicken recipes out there…but there’s a reason recipes turn into classics…at the core, they are good. 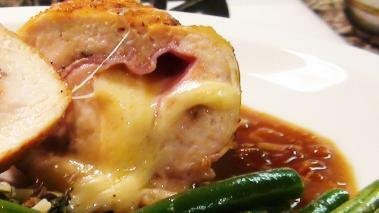 In this recipe video, I show you how to make a pretty traditional chicken cordon blue. But, like every dish on NoRecipeRequired…remember it’s as much about the cooking techniques as the recipe itself. You can easily modify this dish by using other types of ham (prosciutto, speck, Iberico, bacon…) or other cheeses (fontina, manchego, provolone…). Not to mention, the other ingredients, meat, dairy, or vegetable that you can swap in and out. Regardless, I think this straight forward version is great, and I hope you enjoy it as much as I do. You can overstuff/understuff the chicken breast. Overstuffed, it gets hard to role up, and the cheese can start oozing out everywhere; understuffed, and you lack the flavor and wow of the ham and cheese. I generally think about 2 slices of ham, just smaller in size than the surface of the chicken, with about the same amount of Swiss cheese is a good ratio. Hope you enjoy this chicken cordon bleu as much as I do! Wine Recommendation: From the white side, I'd suggest a California Chardonnay, that has enough body to balance the creaminess of the cheese and flavor of the ham. But this is also a dish where reds will work well, and I personally am more often going to go with a light, fruity pinot noir…perhaps from Oregon.